As I wheeled my mother through the Kirklin Clinic last week in a metal contraption that was half-wheelchair, half-grocery buggy, I couldn’t help but notice the difference between her and all the other patients. The main difference being that she was post-op, and many of them were pre-op. For her, the worst part was over and for them, it was a fearful unknown that was yet to come. She was there for a checkup with her cardiac surgeon, hugging her little heart-shaped pillow and smiling happily at everyone we passed. Her radiant glow was a stark contrast to the gripping shadow of anxiety that I saw written on so many other faces in that clinic. There was one lady in particular who we talked with for a long time in the waiting room. She was there (alone!) for her final phase of testing before her open heart surgery, and she was scared to death. Mom talked with her for a long time and filled her up with positive affirmations and good news that day. Now those are some words I never thought I’d hear just hours after a surgery of that proportion, but that’s exactly what she said to me in the recovery room. The last time I updated you about my mom, she was tucked safely away in CICU at UAB Hospital, waiting for an aortic heart valve replacement. The morning of her operation, I woke up in the dark and drove my dad downtown to be with her before surgery. Surgery was scheduled for 8:00 am, so we planned to arrive early. On the way down there we got a text message saying that they were going to take her even earlier than originally planned. Since the parking deck was three city blocks away from her hospital room, I dropped my dad off at the front door and went to find a parking space. 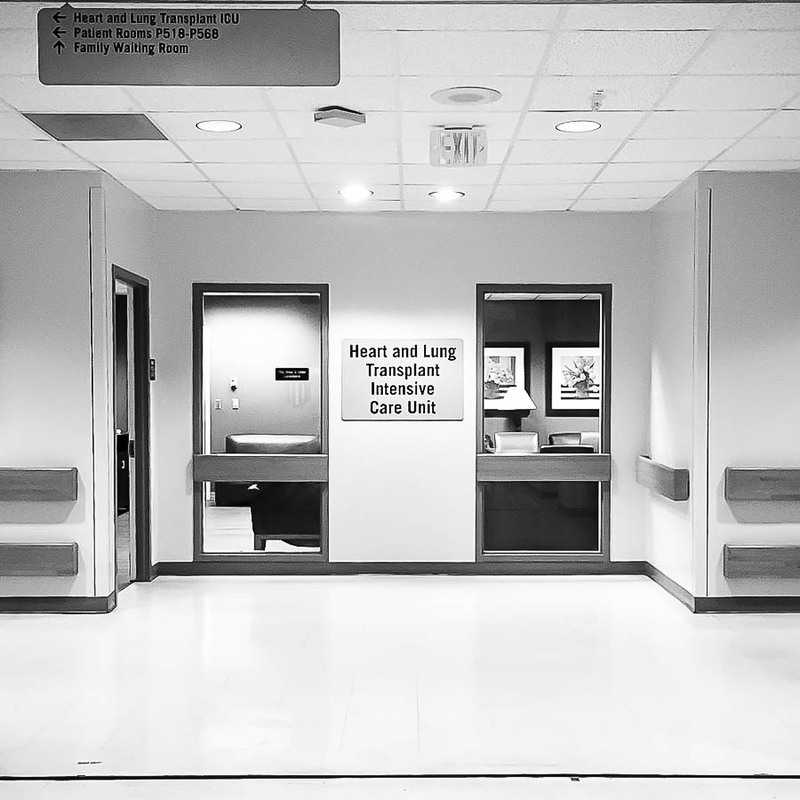 As I arrived on the floor of her hospital room, I saw a man standing beside a gurney with the word “SURGERY”emblazoned across the bottom, chatting with a nurse in the hallway. I picked up my pace and zoomed past them both, hoping to get a chance to see mom before they wheeled her away. I arrived just in the knick of time, because minutes later that same gurney arrived at her door to take her to the operating room. Luckily, they allowed us to walk beside her, holding her hand all the way down the long hallways, over the Skybridge to a whole other building, and back into the pre-op holding area. We were with her right up until the moment she was taken to the operating room, which gave us all a whole lot of peace. 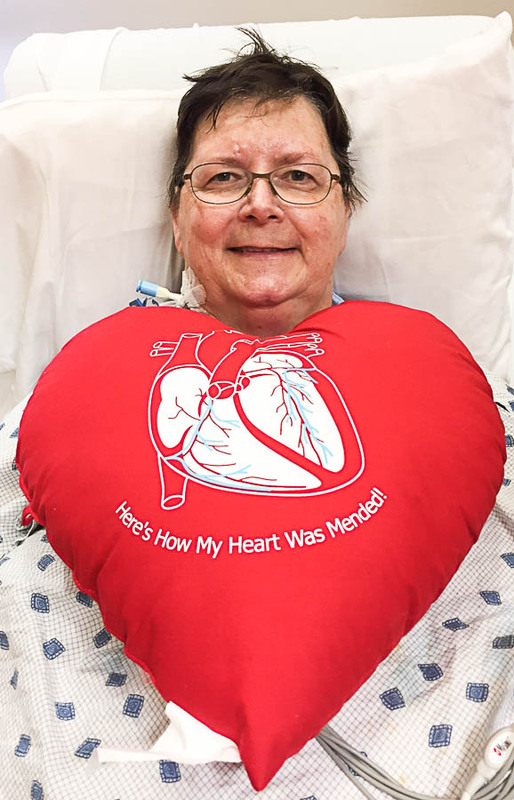 She was in great spirits when she went back, laughing and joking with the cardiac team. They told us it would be a minimum of an hour of prep and four hours in surgery, barring any complications. All day we waited, pacing the halls outside the waiting room and cafeteria. We even got a surprise visit from one of mom’s dear friends who drove down from Nashville with her daughter. I had such a peace over me that day. There was no fear, no anxiety, just a peaceful knowing that mama was going to be just fine. Mom later called it “riding a wave of God’s love” and that is the best way to describe it. It’s a really great place to be, safe in His arms. All those prayers from you, our friends and our family. Those prayers were felt. They have carried us through this entire time. Every night when I left the hospital parking deck I said a prayer of thanks that this was my view. 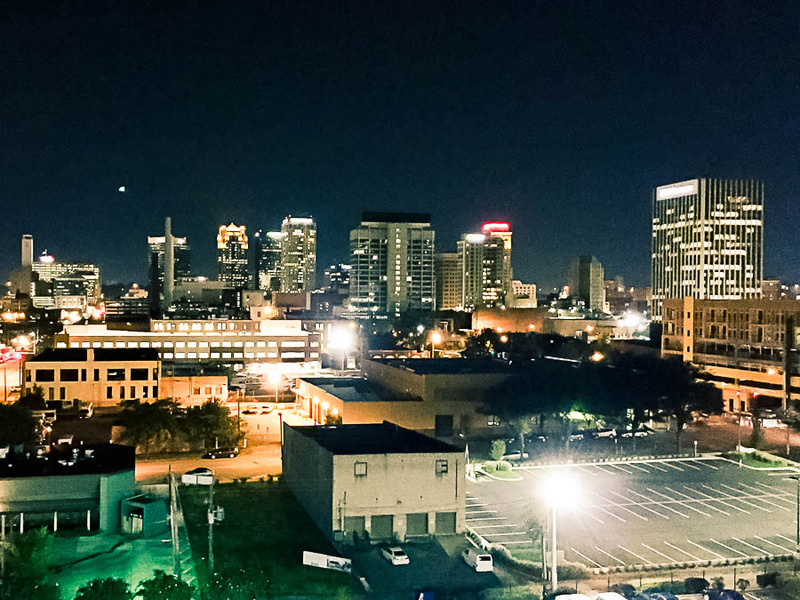 We were SO grateful to be at UAB in downtown Birmingham for this surgery. It is one of the best hospitals in the nation for cardiac surgeons, and it was so convenient to home for us. To say that my mom is a Rockstar is an understatement of epic proportions. This lady woke up from open heart surgery, proceeded to brag about how that wasn’t so bad after all, then refused any and all prescription pain meds in the recovery room. She has been taking TYLENOL, y’all. For open heart surgery. I take Tylenol when I like, stub my toe. She takes it to recover from having her entire chest cracked open and a mechanical valve sewn into the middle of her heart. She is a BEAST, this woman. A straight up tough cookie. I cannot even begin to tell you how great she has done. It’s just been amazing to watch her recovery. She has aced every hospital exam. She came home right on schedule. She has lost 30 lbs in a month! She has made her no-nonsense cardiothoracic surgeon–a stern Croation man who reminded us a lot of Gru from Despicable Me–LAUGH OUT LOUD on several occasions. All of the nurses were petrified of him, but my mother cracked his tough exterior shell and made him laugh. He even took a selfie with her at her visit to his office last week. 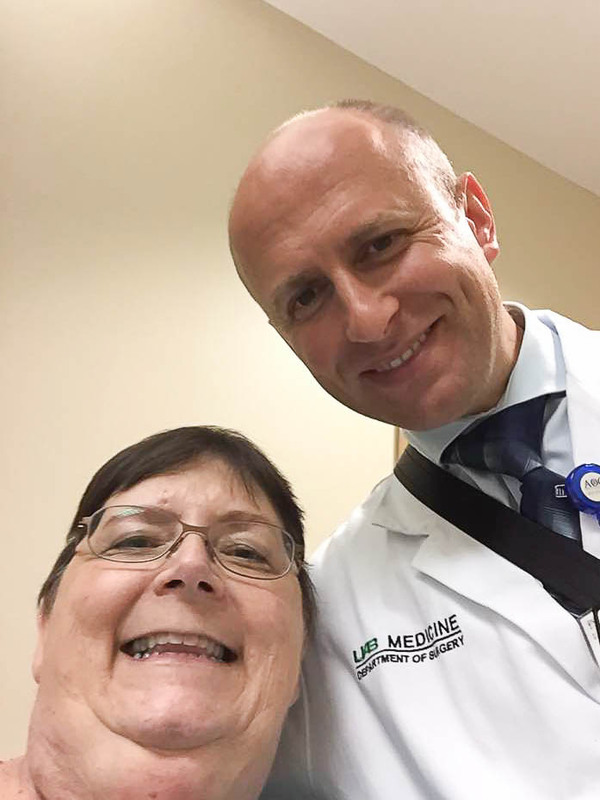 Thank you, Dr. Franjo Siric, for saving my mother’s life. We are eternally grateful. And thanks to all of you, for all of your thoughts, prayers, strength and love that you’ve sent across the internet these past few weeks. They were all felt with an acute clarity like I’ve never felt before. 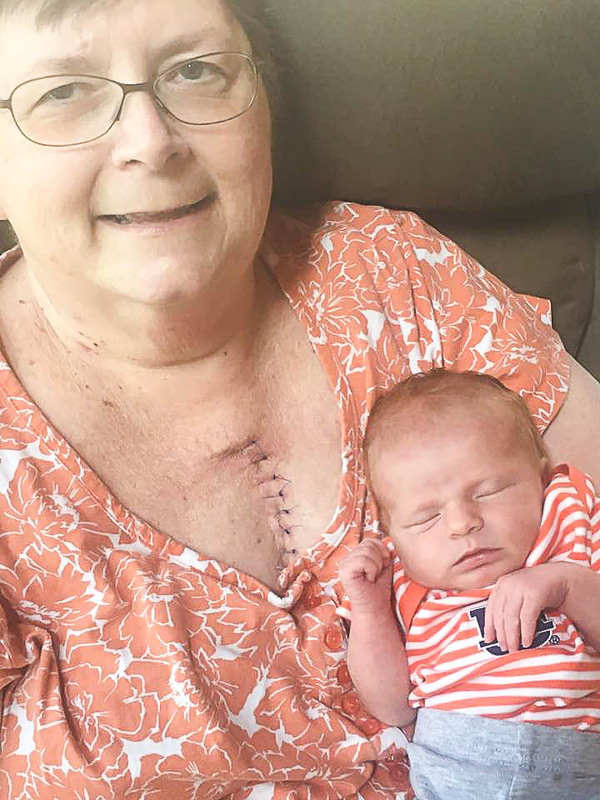 Mom recovering at home, holding her 5 day old great-niece Parker who came for a visit. PS- mom is making it her mission in life to turn all the grandbabies into Alabama fans. She’s 2 for 3 so far. Sorry, Parker. My mother is home, and she is going to be just fine. I am SO happy to hear this Beth! God bless your mom and may she continue to have swift healing. So glad to hear your mom is doing so well. So so so thrilled to hear this! Have been thinking about her and wondering! Thank you for the update and for your positive outlook, it is truly inspiring. God is amazing and I’m glad he gave you peace during this time! So happy to hear about your Mum. Mine wasn’t so lucky 18 years ago. I miss her every stinkin’ day. But the good news is that the research has made it possible for these types of surgeries to be successful more often than not and we can thank the Big Guy Upstairs for that. Blessings to you and your Mama! So happy to hear this news. Isn’t Kirklin Clinic the BEST! They are so good to us when we go for heart checkups for my husband. Awwww…Parker looks so beautiful in her orange and blue! War Eagle! Amen, Beth! May God’s blessing continue to shine through for you guys. God is so good!!! Blessing to ya’ll and Roll Tide!